With the new home, we knew we wanted a front door that made a statement and reflected the Spanish Revival feel we are going for. After scouring custom door companies, we came across Home Redesign Center based in Laguna Hills, CA. 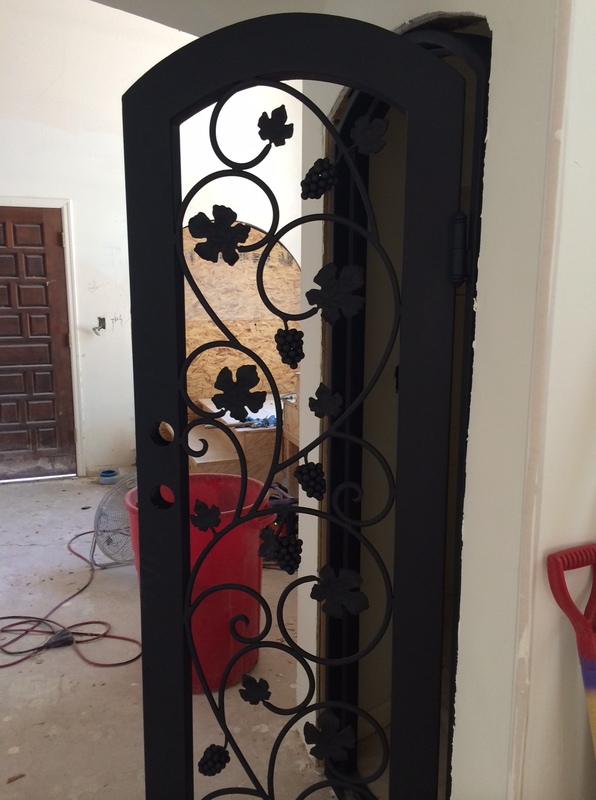 They were great to work worth, and have a wide variety of wrought iron doors and examples on their website to browse – in addition to anything custom wrought iron that you may need. We started with a few styles we liked and had them mock-up sketches based on our ideas. Brandon took a design he liked and tweaked it to be a single door vs. double. Once we started the process with the front door, we decided to commission them to also do our wine door “while we’re at it.” The sketch had a few too many grape bunches going on, so we cut those down to about half of what you see here. Lucky for us our good friend Hunter lives in Laguna and was nice enough to drive them out to us. (All it took was a little trade in brew and 4th of July festivities!). Here’s a sneak peek on how the doors turned out. More soon once the front entrance gets framed out for the new door!